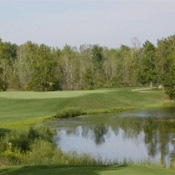 The golf course is in beautiful condition, and now is the perfect time to make plans to come and play 18 holes of golf at one of "Indiana's Hidden Gems." In late March of 1992, ground was broken and little more than two years later on June 13, 1994, Rock Hollow Golf Club’s first nine holes were open for play. The official opening of the 18-hole Championship Golf Course occurred on June 12, 1995. From its first round of golf in 1995 to the excitement of celebrating its ten year anniversary in 2005, Rock Hollow Golf Club has remained a permanent fixture in the league of top tracks not only in the Midwest but also throughout the nation. Last year, Rock Hollow Golf Club made Golf Digest's "201 Places to Play", one of only three Indiana golf courses to be named to this list. In 2004, Golf Magazine named Rock Hollow the “Eighth Best Course in the United States and Canada for under $50”. Rock Hollow remains among the list of best public courses in the United States.